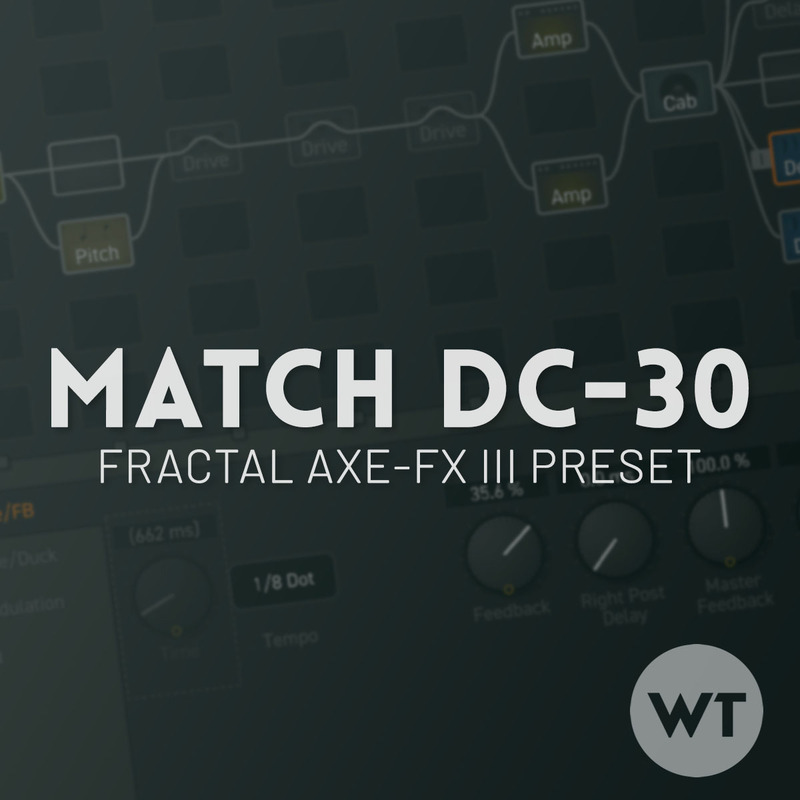 Fractal Axe-FX III preset based on the Matchless DC-30 amplifier. Everything you need to cover modern P&W tones, including multiple drive, delay, reverb, and modulation options. Includes scenes to for instant sounds and custom per-preset mapping and overrides for use with the Fractal FC-12. The preset is stock (no 3rd party IR’s required), and includes options for both single coil and humbucker equipped guitars. Includes the new reverbs introduced in firmware 3.0 and the new drives introduced in firmware 3.02 (requires firmware 3.02)! UPDATE YOUR FIRMWARE: Please upgrade the firmware on your Axe-FX III. and make sure to use the latest version of Axe-Edit III before installing this preset. If your firmware is not up to date, this preset may not load. You can do this with the Fractal Bot software. You’ll need at least firmware 3.0 to load this preset. FC FUNCTIONALITY BUILT IN: This preset was built to work with the Fractal FC-12 and an external expression pedal plugged into the ‘Pedal 1’ input. See the Per-Preset overrides and FC assignments below. Scene 4: P&W LEAD. Big drive (Drive 1A + Drive 3A) with big verb and dual stereo delay (1/8 + 1/8d). Scene 5: AMBI CLEAN. Clean tone with stereo delay (1/4 + 1/8d) and big reverb. Scene 6: 80’s Clean. Clean tone with chorus, 8th note delay. Scene 8: SWELLS. These swells are majestic. Engages all three delays (Delay 3, Channel D is what makes this one go). Also engaged are the Plex Delay, big reverb, and Pitch (Channel C). The pitch block gives a shimmer effect. If you want a more subtle pitch effect, try channels A or B in the pitch block. We’ve used all four channels of three delay blocks (that’s 12 different delays!) . Each delay block runs in parallel with the others so the delays don’t run into each other. Delay blocks are separated into different delay times. For example, Delay 1 is all quarter or 1/8th note delays. Delay 2 is all dotted 8th noted delays, and Delay 3 is all stereo dual delays. Delay threer is a bit different because each channel will give you different rhythmic delays, and Channel D is set to give you a huge wash for swells. Reverb blocks 1 and 2 give you ‘normal’ and ambient reverbs respectively, but the PlexDly block will also give you ambient reverbs. Experiment with these to find your favorite sounds. This preset integrates with the Fractal FC-12. We’ve set up Per-Preset overrides for both effects and scenes, and we’ve mapped them to Layouts 7 (Perform 1) and 8 (Perform 2). If you have an FC-12, the following assignments should be plug-and-play. Layout 7 will be your scenes and Layout 8 will be individual effects, plus swells. All guitars are different, so you may want to make changes to suite your playing style and guitar. The amp block is set up for single coils using Channel A and humbuckers using Channel B. NOTE: If you want to use Channel B of the amp, please be aware that you’ll need to change to Channel B in every scene, otherwise the scenes will switch the channels. You may prefer to create a duplicate of this preset and copy the Channel B settings into Channel A of the amp block.